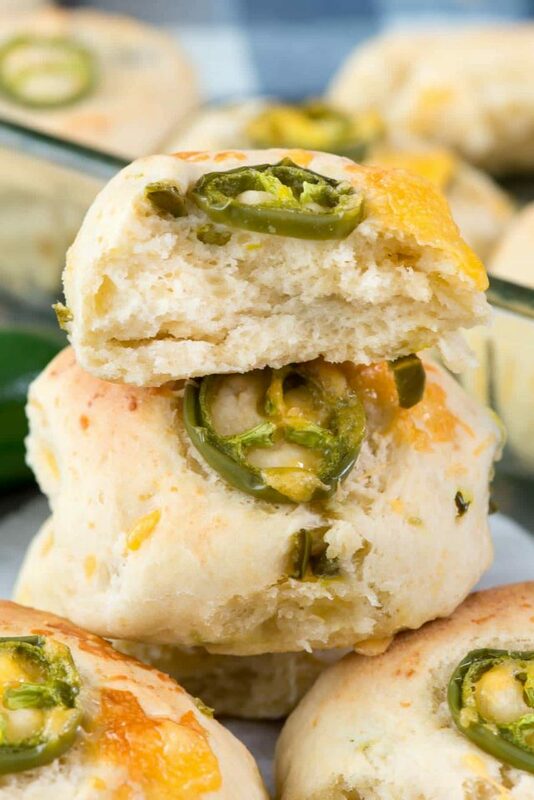 Quick Jalapeno Cheddar Rolls – this easy dinner roll recipe is made in under 45 minutes! The rolls are full of jalapeños and cheddar cheese and are the perfect side dish. Homemade rolls are always better! Until recently, I’d only had jalapeños in something, like salsa. I’d never just eaten pickled jalapeños on something and I’d never even wanted to try jalapeño poppers. That all changed when I tried the jalapeño poppers that my friend’s husband makes because they are SO darn good. They changed my mind about jalapeños in general and made me more interested in trying other recipes and things that included them. As I’ve opened my jalapeño eyes, I started noticing how some of my friends loved them. Pickled jalapeños weren’t just something used as a garnish, but people actually EAT them. Mind blown, I decided to try them myself and I realized pickled jalapeños are GOOD. And then, third time is the charm: I tried jalapeño cheddar bread at a local restaurant. It’s a sourdough place that specializes in all flavors and one of the samples they put out is jalapeño cheddar. I would never have even wanted to try it a few months ago but did on my last visit and fell in love. Now I want to make jalapeño cheddar all the things. 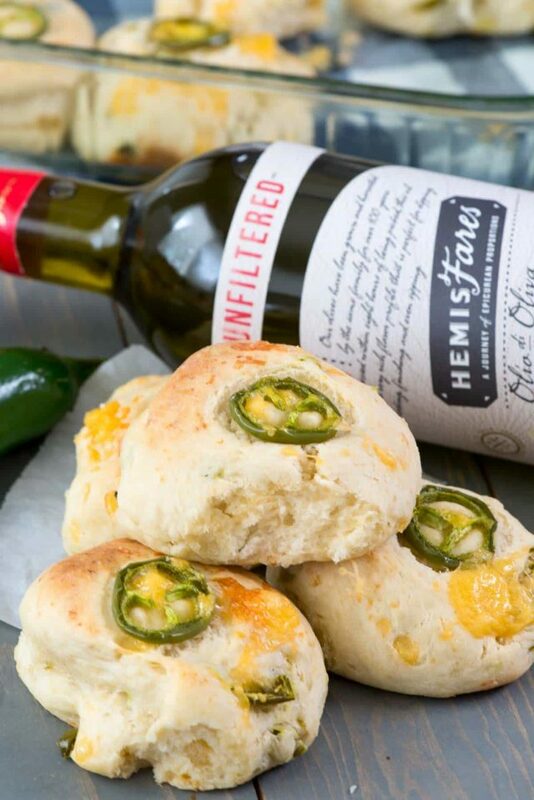 First up on the list: Quick Jalapeño Cheddar Rolls. They’re mixer to table in under 45 minutes and they have all the delicious flavors you expect from something with jalapeño in the name. These dinner rolls are an adaption of a recipe I posted years ago: 45 Minute Dinner Rolls. They were magical then and they’re still magical now: from start to finish these yeasted rolls are done in under 45 minutes. I make them all the time when we are having soup or need rolls for a side dish, or even when I’m making sliders. I’ve used the recipe for a quick pizza dough and cinnamon rolls, and even turned it into small batch, so that I can eat the entire pan. Once you have the basic recipe, it’s easy to flavor them however you want: herbs or garlic, cheese or sweet cinnamon, and yes, jalapeño. Let’s go over some of the ingredients, so you can understand how this magical recipe works. 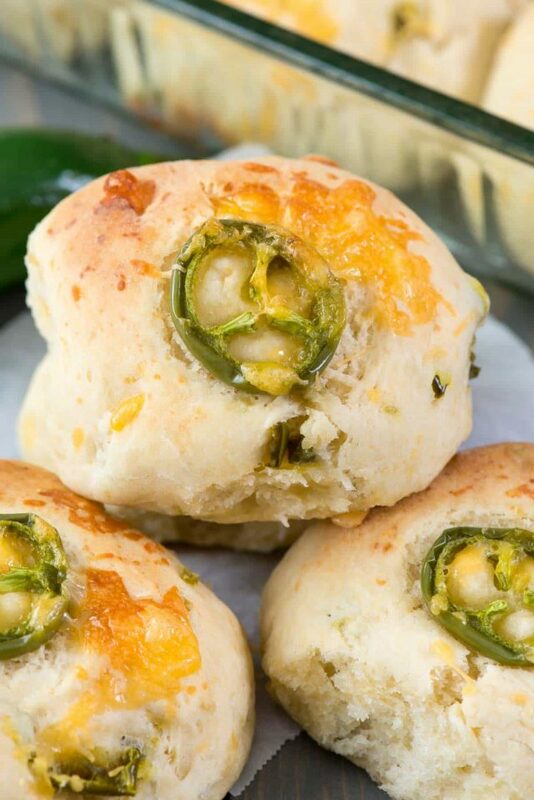 Quick Jalapeno Cheddar Rolls are yeasted dinner rolls on the table in under 45 minutes! Yeast. Obviously, a yeasted dinner roll is going to have yeast. I use active dry yeast for this recipe. To make the rolls rise so fast you need to use a lot of it: 2 whole tablespoons. I keep a jar of yeast in my fridge at all times so it’s easy to measure out that much, but just under 3 of the packets is the correct amount if that’s what you have. Sugar. I add sugar to the yeast to help it bloom faster. Sugar feeds the yeast and gets it all active. Warm water. Not too hot, not too cold, but just right. Channel Goldilocks, because if your water is too cold it won’t activate and if it’s too hot it’ll kill the yeast. I use the hot bathwater rule of thumb, which is about 45 seconds in my microwave. Olive Oil. You want a good quality, yummy tasting olive oil for this bread. It’s the only fat you’re adding and while the olive oil flavor is not obvious, if it’s not a good one you’ll wonder what that funky taste is. I love using HemisFares Unfiltered Olive Oil (find #48, which you can find at Kroger grocery stores). Salt. This is for flavor, don’t skip it though! All purpose flour. Obviously rolls need flour. I use all-purpose because I always have it around. These rolls come out super tender because of all the yeast, so you don’t have to use bread flour if you don’t want too. 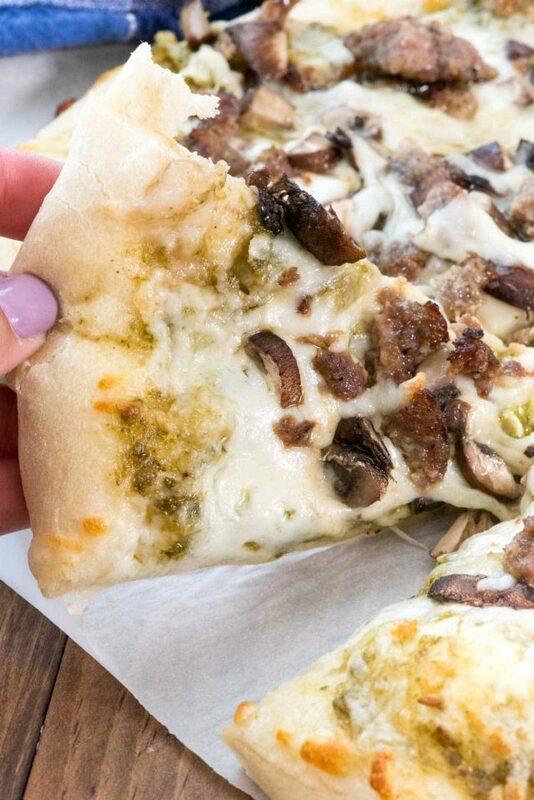 If you want, you can do half and half with whole wheat and all-purpose. 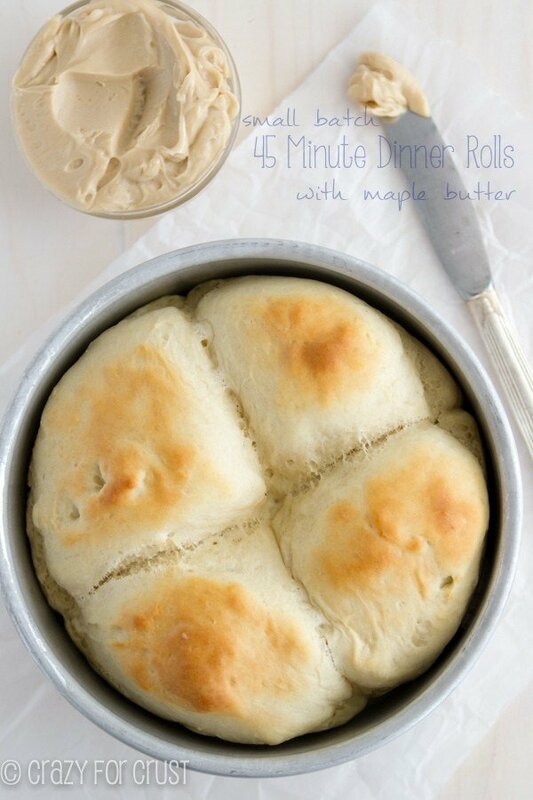 Those are the key components in these easy and fast dinner rolls. Don’t forget the cheddar and jalapeño though; they’re both inside and outside of the rolls! I added chopped pickled jalapeños and shredded cheddar into the dough during mixing, and then a sliced fresh jalapeño for garnish along with more cheese. More cheese is always better! These rise quickly; just 15 minutes for the initial proofing and 10 minutes before baking. They rise up and are fluffy and tender just like a dinner roll should be. Note on mixing: I like to use my stand mixer fitted with the dough hook. It makes these come together much quicker than doing it by hand. You can make them by hand though; just stir with a wooden spoon until you can’t stir anymore and then get your hands in there until the dough comes together. See the video for more details. Quick Jalapeño Cheddar Rolls - this easy dinner roll recipe is made in under 45 minutes! The rolls are full of jalapeños and cheddar cheese and are the perfect side dish. Homemade rolls are always better! Preheat oven to 400°F. Spray a 9x13” baking dish with nonstick cooking spray. 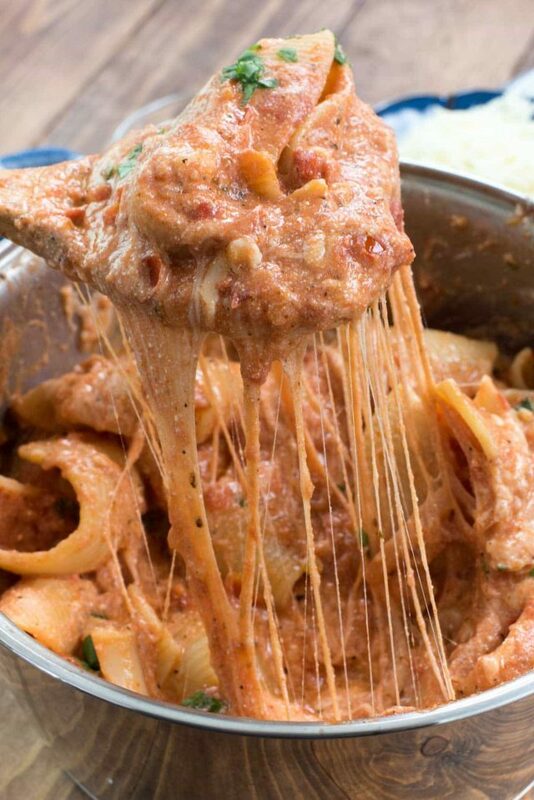 Place the water, olive oil, and yeast in the bowl of a stand mixer fitted with the dough hook. Let the mixture rest for 15 minutes. It will be very frothy when your timer rings! Mix in the salt and flour using the dough hook. Start on low for a few seconds, until the flour starts to incorporate, then switch to medium for about 30 seconds. Add the chopped pickled jalapeños and 1 cup of shredded cheese. Turn the mixer back on and mix until the dough completely comes together. You know it’s done when all of the dough will join to form a ball and the sides of the bowl are almost clean (no dough left). If your dough is too wet, add an additional tablespoon or two of flour. Place dough on a cutting board and section into 12 balls. Place the rolls in the prepared pan. Brush with a bit of olive oil and sprinkle with more cheese. Place one jalapeño slice on each roll. Let rest for 10 more minutes. Bake for about 15-20 minutes, until the tops start to get golden. Cool slightly before handling. Store sealed in an airtight container for up to 2 days or freeze for up to one month. Indeed a super delicious recipe with my favorite combo of pickle and cheese. I will definetly try it really soon. 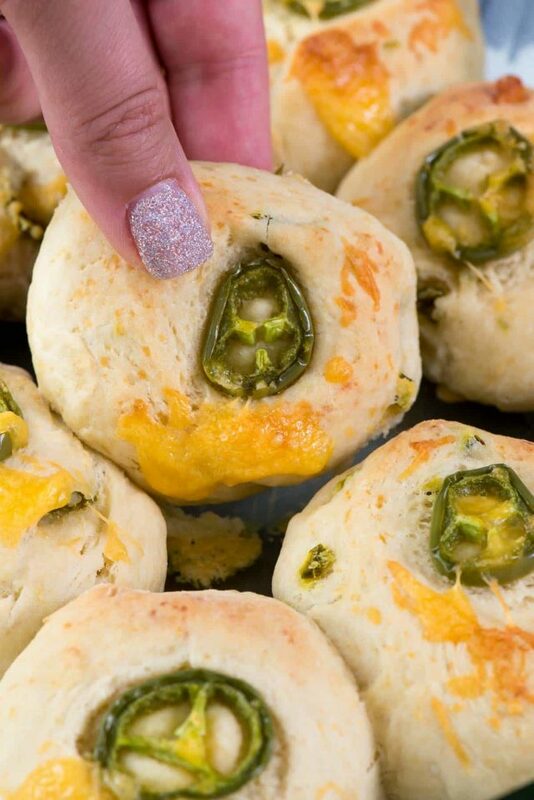 I love that you’re into all things jalapeno right now and these rolls look perfect! Impressive that they are done in 45 minutes too! I made these rolls a couple of days ago. Jalapeños in the store were sad looking, so I used green chiles instead with sharp cheddar cheese. Wow, are these good!! The recipe made big, chewy, delicious rolls that went so well with homemade soup on a cold evening. Thank you for the recipe. It’s a keeper! These are not good. Don’t waste your time and precious ingredients on this recipe.